From the Like department... Score More and Austin Hip-Hop Scene is giving away a pair of free tickets to the Chiddy Bang show @ Republic Live on Dec 3rd! Go to the Austin Hip-Hop Scene Facebook page and "Like" this post and next Wednesday we'll choose the winner! 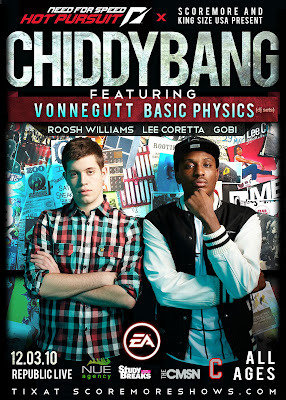 Chiddy Bang is an American alternative hip hop band from Philadelphia, Pennsylvania. The group consists of Chidera "Chiddy" Anamege and Noah "Xaphoon Jones" Beresin. Both are 20 and met at Drexel University, in Philadelphia, PA. Their sound is based on the fusion of hip hop and unique sample choices from alternative leaning artists such as Radiohead, Sufjan Stevens, Passion Pit, and MGMT . In late February 2009, the popular music blog Pretty Much Amazing showcased five songs by Chiddy Bang that were on their MySpace account. Because of this, the group gained some following in the underground among music blogs and local colleges, playing a notably packed show at Swarthmore College in April 2009. 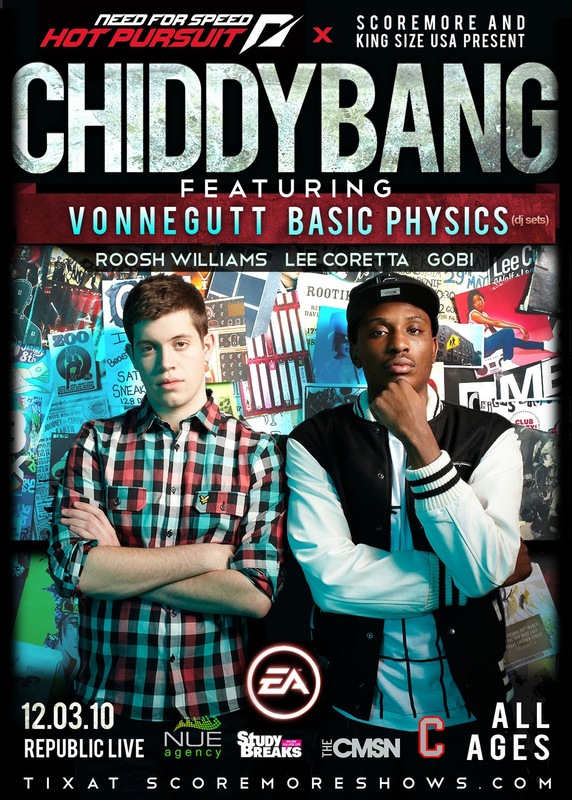 Pretty Much Amazing continued to occasionally release new Chiddy Bang songs, and in November 2009 debuted the group's first free mixtape, entitled "The Swelly Express." It presented the story of the group's experiences trying to break into the music industry. The mixtape quickly gained popularity online and in January 2010 the group signed a record deal with EMI. Their first commercial single, "Opposite of Adults", which samples the Brooklyn group MGMT's 'Kids' was released on February 21, 2010 in the UK. (It had previously been released online under the name "Kids" in April 2009). It reached number 12 on the UK Singles Chart. "Opposite of Adults" was released on April 20, 2010 in the US.